The newly repaired roof of a service building at the Braidwood nuclear plant in Illinois sure looked nice, but Nature decided it would look even nicer over one of the plant’s outdoor power transformers. So, during a storm on January 18, 1996, Nature removed part of the roof from the building and placed it onto the transformer. Figure 1 shows a similar transformer. The transformer may have looked better with its new canopy, but it didn’t work nearly as well. When the reactor was producing electricity, the power transformer increased the voltage of the electricity output by the plant’s main generator to the higher voltage of the transmission lines within the offsite electrical grid. Conversely, when the reactor was not operating, the power transformer decreased the voltage of the electricity coming into the plant from the electrical grid. 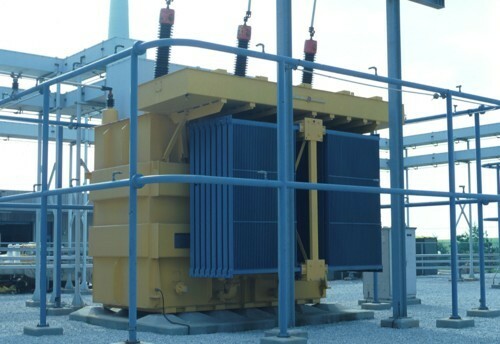 The new bonnet caused the power transformer to short out, interrupting the plant’s connection to one of its sources of offsite power. 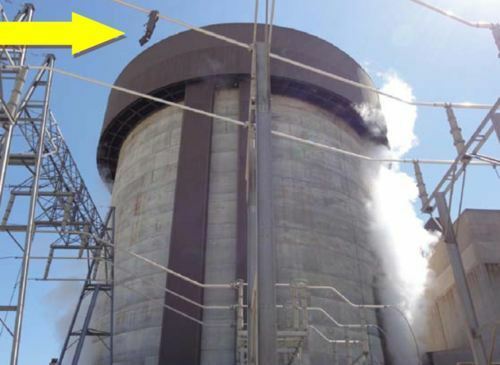 Both reactors at Braidwood remained operating at full power during the incident while workers undid Nature’s handiwork. Human nature replicated Nature’s feat 15 years later. On August 16, 2010, the Unit 2 reactor at Braidwood automatically and unexpectedly shut down from full power. Complications from that shutdown triggered the automatic and unexpected shutdown of the Unit 1 reactor from full power shortly afterwards. Per design, relief valves automatically opened following the Unit 1 shutdown to discharge steam from the piping between the steam generators and the turbine. This steam jetted in the direction of the reactor containment building. The steam jet tore loose a section of the metal siding covering the upper portion of the containment building. Figure 2 shows the gap formed by the dislodged siding. Figure 3 shows part of the metal debris that fell across the power lines connecting Unit 1 with the offsite electrical grid. Something similar had happened even earlier, On August 11, 1994, the Unit 1 reactor at Braidwood automatically and unexpectedly shut down from full power. Per the same design, relief valves automatically opened to discharge steam from the piping between the steam generators and the turbine. 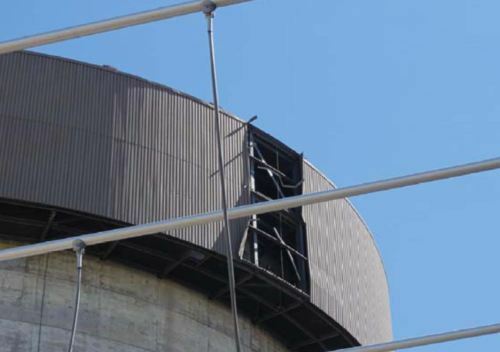 This steam tore loose part of the walkway atop the reactor containment building. Part of the dislodged debris penetrated through the turbine building roof. About every five years, on average, Braidwood sheds building materials like snakes shed their skin. Whether caused by Nature or human nature, the flying debris can potentially damage equipment needed to safely shut down the reactors. Rather than applying band-aid patches to roofs and siding, Braidwood’s owners should seek more permanent solutions. For starters, not aiming the steam relief valves at the reactor containment building would seem to have some merit.